Compared to other types of flooring, laminate flooring is the new kid on the block. Carpet, tile, wood and vinyl have been around for decades but laminate flooring has only really started to catch on in the 90's in the US. In the beginning laminate was not that attractive, it was flat and kind of looked like your kitchen counter. Now they make laminate that looks just like beautiful hardwood floors. I am amazed at the beauty laminate flooring can add to a home. Click on this photo and see if this looks like real hardwood to you. The cost of laminate flooring can be substantially less than the real thing and in a lot of cases is much more durable. The other added feature to laminate flooring is it is relatively easy to install compared to other floors. This can save home owners a fair amount of cash. Although you need to do your homework before attempting it yourself, I have seen some crazy diy jobs. 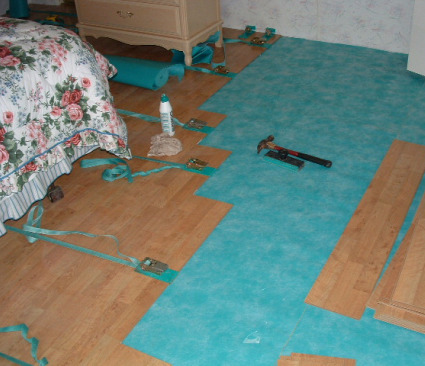 Laminate flooring is what is called a floating floor. It is not secured to the floor in any way. Laminate flooring can expand and contract. There needs to be a space around the whole perimeter to allow for this. It can be installed over a variety of sub floors. Including concrete, plywood, vinyl, and even ceramic tile. 1977- Laminate flooring concept was created. 1984- Launch of the first laminate floor in Sweden. 1989- Pergo Original brand introduced. 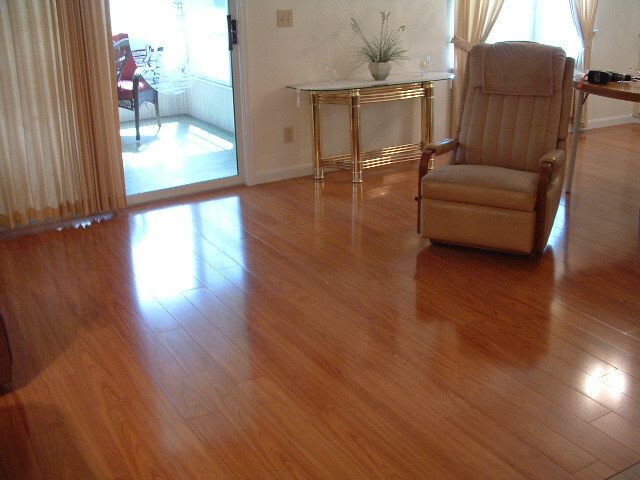 1994- Pergo laminate flooring introduced in the United States. 1996- Flooring factory opens in Garner, North Carolina USA. 2000- The company’s name was officially changed from Perstorp Flooring to Pergo, Inc. and introduced the Pergo Family sub-brand. Pergo has two manufacturing facilities in both the United States and Canada, as well as two plants in Sweden. It was made with a base of several layers of paper, resins were then added then it was pressed together under high pressure with the pattern. This was glued onto another layer that made it stronger. Then it was cut into very precise dimensions. This was the same material that was used for kitchen counter tops and furniture. They developed the flooring that was at least ten times stronger. As laminate evolved the strength increased to twenty times the strength of counter tops. In the early days of laminate flooring the planks were all glued together on the edges. You had to make sure all your joints were together before the glue dried, if you failed to notice a separated joint before it dried you had trouble. Here's what this looked like in the photo to the left. This job was installed in 2003. Today it can be difficult to know if the laminate flooring you want to purchase is a good quality or not. There are dozens and dozens of manufacturers out there, and with the AC ratings, different thicknesses, and all kinds of finishes and locking systems it can be a daunting task to make sure you don't get stuck with an inferior product. Believe me when I say there are a lot of laminate floors out there that look really nice in the box but can be a nightmare when installed. One of the best ways to avoid this is to research as much as possible. You may have friends that have laminate floors, and see first hand how their floor held up. Or one of the best ways is to talk to installers that can give you an unbiased opinion.